Like an apparition or ghost, a coyote runs through my side yard, 20 feet from my house. This is a fuzzy screenshot from a trail camera picture of a Cape Cod coyote on the run. In the full picture, you can barely see it leaving the frame in the dark (50 feet from the trail camera), so I took a screenshot of it from the full size pic. 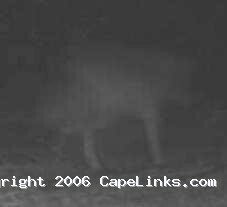 This picture was taken in January 2005 with an infrared game camera. see also coyote den picture. This image has been viewed 10196 times and no comments have been submitted yet. You may leave a comment about this image. You can also view more Nature and Cape Cod images or learn more about Cape Cod.